Posted by Jon in Hasbro, HASCON, Transformers with 1 comment. Fate rarely calls upon us at the time of our choosing. When it does, the Hasbro TRANSFORMERS OPTIMUS PRIME CONVERTING POWER BANK figure will help you be ready and powered up with the spark of a Prime! This special edition power bank converts between robot and charger modes in 16 steps and comes with a blue-Energon LED Light-up sword accessory, mobile phone stand and a Micro USB/USB charging cable. Compatible with most devices the TRANSFORMERS OPTIMUS PRIME CONVERTING POWER BANK figure supports 6500mAh of battery power so you can roll out without worry. 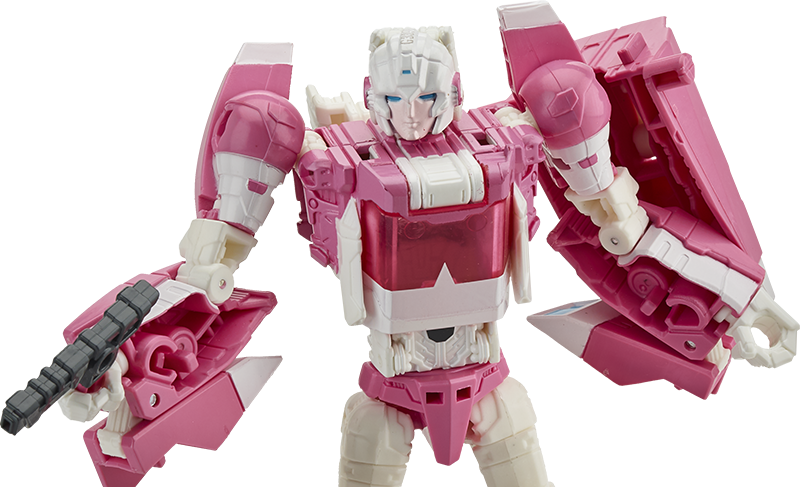 The Hasbro TRANSFORMERS GENERATIONS TITANS RETURN ARCEE SET lets you harness the power of not 1 Titan Master, but 2! Featuring a G1-inspired Titans Return Deluxe Class Arcee figure with Titan Master and a special edition Titan Master Ultra Magnus figure with die-cast parts. The set also includes 2 blaster accessories, 2 collector cards and special edition TRANSFORMERS packaging and custom art for the ultimate play-at-home experience. The Titan Master figures become the head of Deluxe, Voyager, and Leader Class Titans Return figures (each sold separately). HASCON (Sept. 8-10 in at the Rhode Island Convention Center) will bring Hasbro’s most iconic brands to life like never before, including TRANSFORMERS, MY LITTLE PONY, NERF, MAGIC: THE GATHERING, PLAY-DOH, MONOPOLY and G.I. JOE and exceptional partner brands such as BEYBLADE, DREAMWORKS TROLLS and SESAME STREET. Fans will get a peek behind the Hasbro curtain during the three days filled with exciting first-look previews and panels from Hasbro’s biggest television and movie series, including Hasbro’s TRANSFORMERS: RESCUE BOTS, LITTLEST PET SHOP and MY LITTLE PONY: FRIENDSHIP IS MAGIC as seen on Hasbro’s joint-venture television network Discovery Family. Cannot wait to pick this up there. So awesome!